The southern magnolia (Magnolia grandiflora), with its shiny, heavy, evergreen leaves and its fragrant, creamy-white blossoms, is one of the best-loved trees of the South. Its large, waxy flowers (which can be as big as dinner plates) gave rise to the species name grandiflora, given to this tree in 1759 by famed Swedish botanist Carl Von Linne (Linnaeus). The common and generic name Magnolia honors French botanist Pierre Magnol, who helped develop the method of classifying plants in the 1700s. Colonial naturalist Mark Catesby called it the Carolina laurel, and the tree is also known as bull bay, a name used by early botanists. Although native to the Gulf Coastal Plain from East Texas to central Florida and to the Atlantic Coastal Plain from central Florida to coastal Virginia, the southern magnolia has been widely planted as an ornamental and is now found throughout the Southeast and in warm temperate and tropical areas around the world. The 80–120 living magnolia species are descendants of some of the earliest of flowering plants, and early magnolias may have coexisted with dinosaurs. Some botanists believe that magnolias originated before bees, leading the tree to depend on beetles for pollination. Magnolias lack the uniquely different petals and sepals that characterize most flowering plants, and botanists coined the word tepals to describe magnolias’ showy white flower parts. Southern magnolia leaves can measure between five and eight inches long, have smooth edges, and are often nearly elliptical, with a distinct rusty felt-like pubescence on the underside. Southern magnolias are well adapted for the southern Coastal Plain, with deep roots that hold the trees firm in hurricane winds and tough bark that makes them somewhat resistant to the region’s frequent fires. They are somewhat tolerant of shade but intolerant of a lengthy cold season or drought. Under optimum conditions of rich, well-drained soils and good sunlight within forest habitat, a southern magnolia can grow to more than ninety feet tall and develop a trunk with a diameter of more than three feet. When grown as an ornamental in the open, magnolias are not so tall but can develop massive limbs, resulting in a stocky tree with a broad reach. Magnolias have long been planted as ornamentals in front of southern homes. Few plants can grow beneath a magnolia because of the shade created and the slow-to-decay magnolia leaves that accumulate on the ground. Magnolia flowers appear most frequently during May and June but also occasionally in the fall. Seeds mature in late fall or early winter in fleshy, cone-like structures. At maturity the seeds have a red, fleshy covering and are pushed from the cone-like structure, with each one suspended by a short fiber and thus “hanging ready” for consumption by birds. These fruits, which measure between a quarter of an inch and half an inch, attract numerous birds and other wildlife. The seed ensconced inside the coating passes intact through a bird’s digestive tract, dispersing southern magnolias and helping them establish in the wild in many areas where the tree was introduced. On 26 January 1861 the Mississippi secession convention adopted what has been called the Magnolia Flag as the official flag of the “Sovereign Republic of Mississippi.” The Magnolia Flag bore a single white star on a field of blue at the upper left, and most of the remainder of the flag was a white field with a southern magnolia tree somewhat centered to the right of the blue. A strip of red sometimes bordered the right edge of the flag. The Magnolia Flag served as the official Mississippi flag for thirty-three years. In the twenty-first century, some people have suggested restoring the Magnolia Flag as the official state flag. In November 1900 schoolchildren across Mississippi voted overwhelmingly in favor of the southern magnolia as the state flower. In 1935 schoolchildren selected the southern magnolia as the state tree, a choice that the legislature ratified on 1 April 1938. 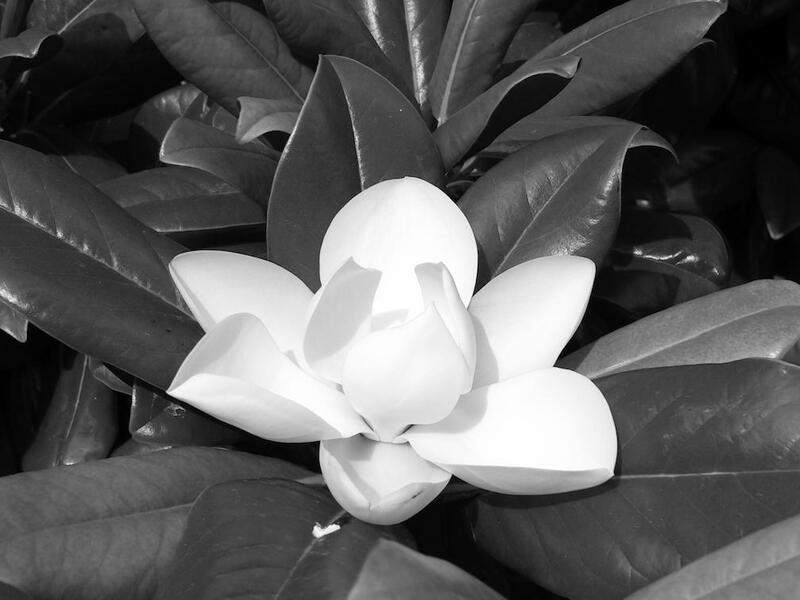 The state legislature did not make the southern magnolia the official state flower until 1952. Neighboring Louisiana has also adopted the southern magnolia as the state flower. The wood of the southern magnolia has been used in making veneer, furniture, packing crates, interior trim, cabinets, and doors. Native Americans of the South used decoctions made from magnolia bark to treat skin and kidney ailments. Modern pharmaceutical companies are investigating chemicals derived from magnolias for potential medicinal use. The major human use of southern magnolias today is as an ornamental, and more than one hundred varieties have been developed for the horticultural trade. Mark Catesby, The Natural History of Carolina, Florida, and the Bahama Islands, Containing the Figures of Birds, Beasts, Fishes, Serpents, Insects, and Plants (1730). E. F. Gilman and D. G. Watson, Magnolia Grandiflora Southern Magnolia, US Department of Agriculture Forest Service, Fact Sheet ST-371 (1994). F. Griffin, Magnolia, Newsletter of the Southern Garden Historical Society (Fall 1984). L. A. Taylor, Plants Used as Curatives by Certain Southeastern Tribes, Botanical Museum of Harvard University (1940); N. G. Treseder, Magnolias (1978).